Yesterday, within the space of an hour, I had two people I care about ask me about living gluten-free. Since this month marks the sixteenth anniversary of my coping with celiac disease, it seems appropriate to write a new post summing up much of what I have learned throughout these years. Don’t Panic with a celiac disease or gluten-intolerance diagnosis. Slow down. Learning is going to take a while, but even with mistakes you are going to feel better immediately when you go gluten-free. It is doable, far more doable today than sixteen years ago when I began, or twenty and thirty and forty years ago, as it is with some people. To begin all you really need is to know how to use an online search engine. Plug celiac disease, gluten-intolerance, gluten-free into Google or Bing or Yahoo, and you will find a wealth of information and support groups. No one can do the diet for you. The doctors can’t do it for you (in fact they are very often a hindrance to which I’m not going to speak.) The dietician can’t do it for you (and often is ill-informed), your experienced neighbor or aunt can’t do it for you, and you cannot even do it for your child. Your child must cooperate if she wants to be well. The part of family and friends and caring people is to be supportive. Support makes all the difference, but in the end, choosing for our own health must be done by each of us. In the beginning keep it simple and safe. There is nothing stressful about cooking a simple, and healthy, meal of meat, vegetables, and fruits. If you like rice, that’s easy to make. Keep everything as simple as you can. If you have been very sick, your stomach needs to recover. Cooking simple will help this. In the beginning I used books. Search Amazon and your library and bookstore if you want books. It seems those I used are out of print, but there are a wealth of new books out there. An abundance of cookbooks! If money is an issue, check your local thrift store, which is where the Dummy books above were found. 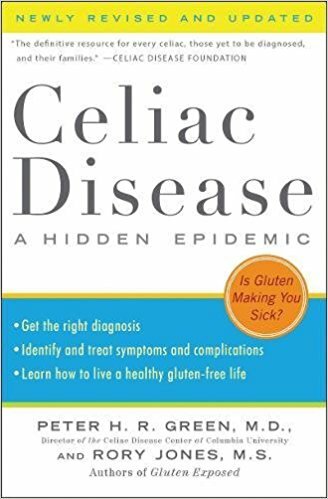 I did find this one on Amazon by Dr. Peter Green, a recognized expert on the disease, whose articles and findings helped me a great deal in the early days: Celiac Disease, a Hidden Epidemic. Gluten Intolerance Group. I have found them a constant help and at the forefront of new knowledge and making life easier for everyone with celiac disease and gluten-intolerance. Beyond Celiac. Up-todate information, an abundance of the latest information, everything from a symptom checklist to testing information, and even a print-out to take to your doctor. Delphi Celiac Disease Forum. These are people in the trenches. Lots of mothers with children who need to be gluten-free. Lots of kind men and women who know the gluten-intolerant condition forwards and backwards. Gluten Free and More Magazine. Articles on living with celiac and gluten-intolerance and other allergies, recipes, reporting on research. Gluten Free Living Magazine. Articles on living gluten-free, research, recipes. One article I found here I believe is a must-read: Genetic Testing. It includes insurance info and the labs doing genetic testing for Celiac. My own eating habits are keep it simple. Last night’s supper consisted of cooked organic chicken breasts seasoned only with olive oil, salt, pepper, garlic powder, canned black-eyed peas, cold chopped cucumber with raspberry vinaigrette, piece of gluten-free cornbread with butter. It is unusual for me to have any bread, but I had it sitting on the counter. I love fresh fruit– in season now peaches, watermelon, cantaloupe. I favor salads made from organic Romaine lettuce, chicken, other favored ingredients. Or a simple favorite is a steak cooked on the grill and an organic baked sweet-potato. I enjoy sometimes twice a day a cup of black tea, with a slice of toasted All But Gluten brand whole grain bread (Publix) topped with jam. And I’m a cookie lover; currently my sweet desire is for Udi’s Caramel Cashew cookies. Also love Pamela’s graham crackers, and the dog and I share these several nights a week. Other than that, I do not eat sandwiches or hamburgers with buns, anything of that sort. Simply don’t like them. My dear sister-in-law brings me box mixes from Aldi’s Stores–brownies, cookies, cornbread, sponge cake, all very reasonably priced! If you have Aldi’s near you, you’re in luck! A helpful thing someone said to me at the outset: Fun is spelled f-u-n, not f-o-o-d. Our society does get these confused. I find it helpful to never go hungry to a social event where there will be a lot of food and eating, and I just chat and ignore the food. Usually these days, though, there is something I can eat. I also carry ’emergency’ food in my car or purse: Van’s Gluten-free Cranberry Oat bars or a package of gluten-free cookies, container of peanuts, Hormel Vienna Sausage. Doing this saves me from simply skipping food. There are many, many restaurants now with gluten-free awareness and menus. Favorites are Jason’s Deli (eating there tonight), Chick-Fil-A (where else will a sweet young person come to your car with an umbrella in the rain? ), Outback Steakhouse, Carrabbas Italian Grill, Olive Garden, Lulu’s Homeport, and I even manage recently to eat at Cracker Barrel when traveling. I love the phone app Find Me Gluten Free. I have over the years of this blog posted much information and many gluten free recipes. You can find these by using the search feature of this site located in the side bar. Use the terms: celiac disease or gluten free. You can read my own story of discovering and learning to live with celiac disease here. God bless you all with good health. 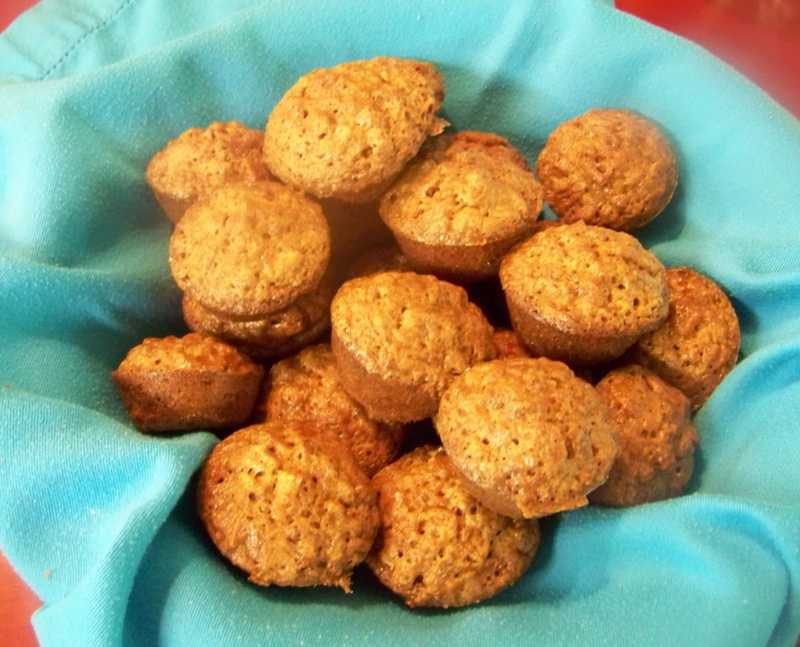 Pecan Mini Muffins. Yes, gluten free!